This course is tutored around the world by Ruth ‘Rug Lady’ Travis, WoolSafe North America Director or in the UK by Paul Pearce. Demand will be very high and places are limited so please book your place early to avoid disappointment. The course is open to everyone and places are allocated on a first come, first served basis. WoolSafe members receive a big discount. The Rug Cleaning Technicians course covers natural (wool, silk, cotton, linen, coir, sisal) and synthetic (rayon, nylon, polyester, acrylic, olefin) fibers, weaving, hand-knotting and tufting; dyeing; rug types and identification; cleaning techniques ranging from minimum-moisture to total-immersion; fringe cleaning, blocking and minor repairs. 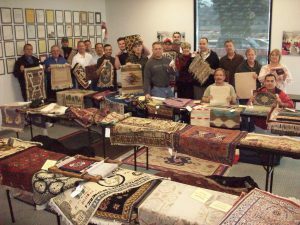 This is the industry’s most extensive hands-on rug cleaning course, with live demonstrations of hooked, Flokati, Dhurrie, Kelim, oriental and designer rugs, and also demonstrations of actual cat urine removal and several methods of fringe cleaning. You’ll learn to identify all major types of oriental and specialty rugs, with scores of rugs on display. The Institute of Inspection, Cleaning and Restoration Certification recently approved a new certification category to be named Rug Cleaning Technician (RCT). The IICRC RCT-141 exam is offered at the end of the course. Payment for taking the IICRC exam is seperate and paid directly to the IICRC. Prerequisites for taking the RCT certification are the Carpet Cleaning Technician (CCT) and Upholstery and Fabric Cleaning Technician (UFT) Certifications. This is one course that you can’t afford to miss. All PowerPoint presentations contain videos, including the history of rugs and numerous videos of rug making construction and hand-knotting techniques. 3 day course; 21 hours, not including lunch and breaks.